A headache is pain or discomfort in the head, scalp, or neck. Serious causes of headaches are rare. Most people with headaches can feel much better by making lifestyle changes, learning ways to relax, and sometimes by taking medicines. May be related to stress, depression, anxiety, a head injury, or holding your head and neck in an abnormal position. Tends to be on both sides of your head. It often starts at the back of the head and spreads forward. The pain may feel dull or squeezing, like a tight band or vice. Your shoulders, neck, or jaw may feel tight or sore. The pain may be throbbing, pounding, or pulsating. It tends to begin on one side of your head. It may spread to both sides. The headache may be associated with an aura. This is a group of warning symptoms that start before your headache. The pain usually gets worse as you try to move around. Migraines may be triggered by foods, such as chocolate, certain cheeses, or monosodium glutamate (MSG). Caffeine withdrawal, lack of sleep, and alcohol may also be triggers. Rebound headaches are headaches that keep coming back. They often occur from overuse of pain medicines. For this reason, these headaches are also called medicine overuse headaches. People who take pain medicine more than 3 days a week on a regular basis can develop this type of headache. 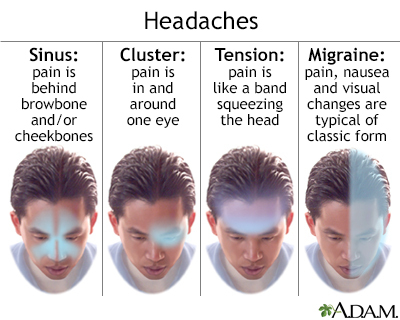 Cluster headache is a sharp, very painful headache that occurs daily, sometimes up to several times a day for months. It then goes away for weeks to months. In some people, the headaches never come back. The headache usually lasts less than an hour. It tends to occur at the same times every day. Sinus headache causes pain in the front of the head and face. It is due to swelling in the sinus passages behind the cheeks, nose, and eyes. The pain is worse when you bend forward and when you first wake up in the morning. Headaches may occur if you have a cold, the flu, a fever, or premenstrual syndrome. Headache due to a disorder called temporal arteritis. This is a swollen, inflamed artery that supplies blood to part of the head, temple, and neck area. There are things you can do to manage headaches at home, especially migraines or tension headaches. Try to treat the symptoms right away. Drink water to avoid getting dehydrated, especially if you have vomited. Rest in a quiet, dark room. Place a cool cloth on your head. Use any relaxation techniques you have learned. Review your diary with your health care provider to identify triggers or a pattern to your headaches. This can help you and your provider create a treatment plan. Knowing your triggers can help you avoid them. Your provider may have already prescribed medicine to treat your type of headache. If so, take the medicine as instructed. For tension headaches, try acetaminophen, aspirin, or ibuprofen. Talk to your provider if you are taking pain medicines 3 or more days a week. This is the first headache you have ever had in your life and it interferes with your daily activities. Your headache comes on suddenly and is explosive or violent. Your headache is "the worst ever," even if you regularly get headaches. You also have slurred speech, a change in vision, problems moving your arms or legs, loss of balance, confusion, or memory loss with your headache. Your headache gets worse over 24 hours. You also have a fever, stiff neck, nausea, and vomiting with your headache. 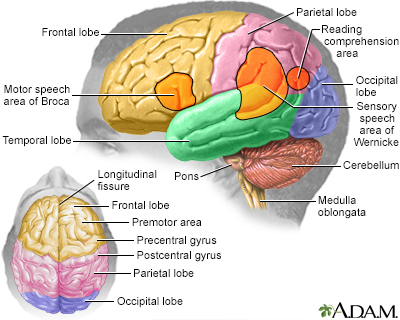 Your headache occurs with a head injury. Your headache is severe and just in one eye, with redness in that eye. You just started getting headaches, especially if you are older than 50. Your headaches are associated with vision problems, pain while chewing, or weight loss. You have a history of cancer or immune system problem (such as HIV/AIDS) and develop a new headache. Your provider will take a medical history and will examine your head, eyes, ears, nose, throat, neck, and nervous system. Your provider will ask many questions to learn about your headaches. Diagnosis is usually based on your history of symptoms. Hoffman J, May A. Diagnosis, pathophysiology, and management of cluster headache. Lancet Neurol. 2018;17(1):75-83. PMID: 29174963 www.ncbi.nlm.nih.gov/pubmed/29174963. Reviewed By: Luc Jasmin, MD, PhD, FRCS (C), FACS, Department of Surgery at Providence Medical Center, Medford OR; Department of Surgery at Ashland Community Hospital, Ashland OR; Department of Maxillofacial Surgery at UCSF, San Francisco, CA. Review provided by VeriMed Healthcare Network. Also reviewed by David Zieve, MD, MHA, Medical Director, Brenda Conaway, Editorial Director, and the A.D.A.M. Editorial team.